Brathwaite was picked at at price of INR 5 crore. Windies all-rounder Carlos Brathwaite has a nostalgic relation with the iconic Eden Gardens in Kolkata. During the World T20 in 2016, the hulk-like player helped his national team win the championship from a state of hopelessness. The Barbados-born cricketer took English speedster Ben Stokes to the cleaners and smacked four sixes off his bowling in the final over. He couldn’t flourish much thereafter and has only represented the Caribbean team in three Tests, 28 ODIs and 33 T20Is. Nevertheless, the threat he poses can’t be overlooked by any stretch of the imagination. 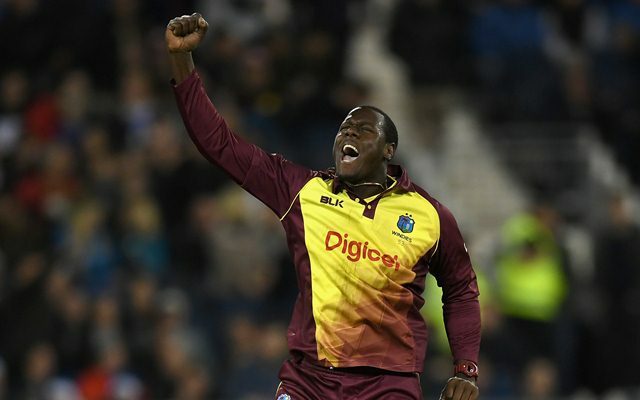 Brathwaite also has had the privilege of playing in the cash-rich Indian Premier League (IPL) after making his debut for Delhi Capitals (DCS), then Daredevils in 2016. However, he didn’t live up to expectations and was released by the franchise. Nevertheless, Sunrisers Hyderabad (SRH) picked him in the erstwhile edition and yet again, he wasn’t quite at his best. This time around, Brathwaite was listed at a base price of INR 75 lakhs and wasn’t expected to go big. But the scenario in the auction turned out to be a different one for him. Kings XI Punjab (KXIP) and Kolkata Knight Riders (KKR) were involved in an intense bidding war for quite some time and eventually, it was the Knights, led by wicketkeeper-batsman Dinesh Karthik, drafted him in at a whopping price of INR 5 crore. Brathwaite would also have the luxury playing alongside the likes of Sunil Narine and Andre Russell- his Windies’ teammate.